Some lucky individuals may have budgets that stretch to Ford F350s to haul their massive mobile palaces, but those of more modest means – i.e., most of us – need to keep a tighter grip on the purse strings, and even more so while the kids are still on the payroll. 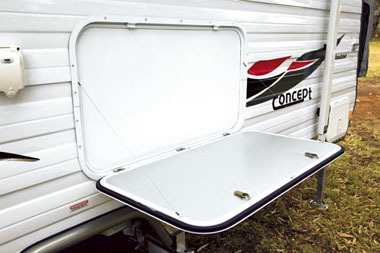 With this in mind, Melbourne-based manufacturer Concept Caravans has introduced the Icon range. It’s a three-strong line-up of expandable pop-tops, where some clever thinking has made the most of that precious resource – space. During CW’s most recent visit to Concept, we were met by one of the firm’s three co-directors, Keir Smith, who explained the motives behind the introduction of the Icon range. Equipped with fold-out double beds at either end, the Icon will appeal to families. Combined with the pop-top roof, this means there’s plenty of space when the van is set up, despite its compact dimensions while under tow. Each of the three Icon models has a different floor plan, and what you see is pretty much what you get – this is an ‘off the rack’ van, and if you’re after a custom layout, you’ll have to look elsewhere. But if the design appeals, the Icon comes with quite a list of standard inclusions. And, due in part to its size, and the fact there’s no shower or toilet, you’ll be pleasantly surprised by the pricing. CW’s review Icon was a 15ft 6in (4.72m, internal length) model with a few optional extras, like a 19in LCD flatscreen TV, a Winegard antenna and an external fold-down picnic table. It’s a smart-looking thing, with tasteful and understated graphics, 15in alloy wheels, moulded front and rear sections and LED tail-lights and running lights. The 15in rims are standard for the 15ft 6in and 16ft (4.88m) models, while the smaller 14ft (4.27m) model comes with 14in wheels. There’s a spare wheel mounted on the rear bumper, which swivels down through 90° to accommodate the rear fold-out. The Icon sits on a 6in SupaGal chassis made by Melbourne’s Preston Chassis, and rides on eye-to-eye leaf-spring suspension. A meranti timber frame is then enclosed with traditional aluminium cladding down each side, and Concept says the pop-top roof features a heavy-duty gusset and a one-piece aluminium lower roof construction, effectively keeping any rain and subsequent leaks at bay. Concept also offers what it calls an “X Pack” for the Icon, which includes a beefed-up suspension, chassis and wheels for more adventurous sorts. On the drawbar you’ll find twin 4.5kg gas cylinders and a mains tap, while a slim section of checkerplate runs along the bottom of either side of the van for that little extra style. The Icon has a tunnel boot at either end, with multiple access points including external hatches on each side. This goes some way to make up for the fact you lose a traditional front boot due to the front fold-out, but in general I was pleasantly surprised at the amount of storage space the Icon offers. A Dometic A&E awning is fitted, and there’s an external powerpoint, an external light and an illuminated grab handle to help you up through the Camec triple-locker door, onto the checkerplate-lined step, and then into the van itself. Once inside, you’re greeted with a mid-kitchen, forward dinette arrangement, with of course the two ‘bedrooms’ at either end. Opposite the door is the four-seater dinette. It’s a booth-style layout, with two double seats facing each other and a table in between. Refreshing and seemingly durable fabrics have been employed, and the cushioning itself is first class. There’s good storage underneath each seat, and certainly room for a deep-cycle battery should you want one. 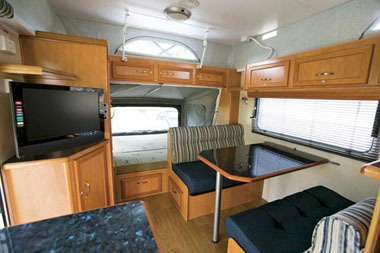 There aren’t any hatches or skylights, but it’s light enough inside thanks to the two decent-sized Jupiter acrylic windows – one next to the dinette and one next to the sink – and especially if you zip out the openings in the pop-top gusset and the fold-out sections. For after dark, there are three round fluoro lights in the ceiling, with halogen reading lights either end of the dinette and one for each fold-out section. Thanks to the open-plan layout, there’s a real feeling of space. The fold-outs can be erected with a minimum of fuss – simply raise the moulded cover, pull out the hard base, then insert a section of tubing to hold the canvas in place. It takes about a minute each end, and while the foam mattresses mightn’t exactly be ‘five star’, they’re still comfy enough. Of course the pop-top itself plays its part. Once erected – another one-minute job – it gives a generous internal ceiling height of 1.96m (6ft 5in), although taller people still have to stoop a bit when exiting the van. The kitchen is a great little area. There’s a square sink and drainer on the nearside, with some bench space forward and a four-burner cooktop (three gas, one electric), griller and rangehood aft. Opposite this is an angled section of Laminex benchtop, perfect for food preparation, with a Dometic three-way fridge/freezer alongside. Our van had a 120L fridge, but a 90L item is standard. Then there’s the storage space – and there really is heaps of it. The lack of a hot-water system means there’s a mass of storage under the sink unit, and then there’s the area under the angled section of benchtop, the two slide-out pantry racks, and the overhead lockers dotted around all four walls. There are two major wardrobes at either end as well – each with a mirror – and with the underseat space and twin tunnel boots you shouldn’t be left wanting. 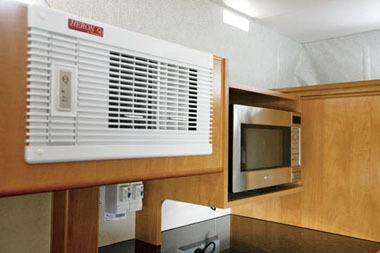 The Heron split-system air-conditioning on the offside wall comes standard, while there’s also a JVC CD/radio/MP3 unit over the nearside kitchen bench, mated with two overhead DNA speakers. An LG microwave is mounted at a sensible height over the fridge. The kitchen features a full-height splashback, and the interior fit and finish are of a high quality. There are timber pelmets over the slimline venetian blinds, and timber edging to the blue granite ‘diamond gloss’ Laminex benchtops and table. All the polyply cabinetry is finished to a high standard too, and comes with quality pushbutton catches. For families on a budget, the Icon is a clever and practical design, executed with all the usual style and flair we’ve come to expect from Concept. With the range starting from under $40,000, it represents good value for money, especially when you consider you can tow the Icon with any decent-sized family sedan. 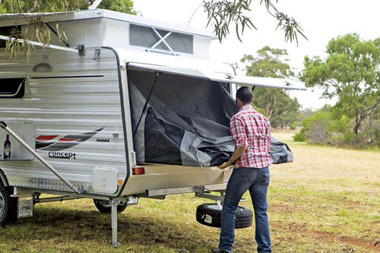 Concept Caravans, 64 Capital Link Drive, Campbellfield, Vic 3061, (03) 9357 6190. 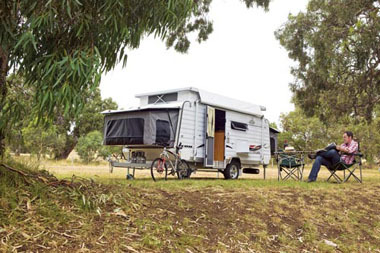 As featured in the June edition of Caravan World magazine, out May 13.